Tag Archives: How do I discharge a planning condition? 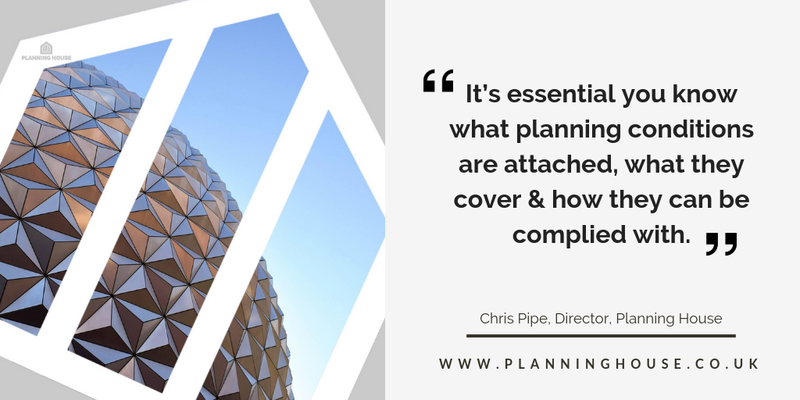 If you have received a planning approval it’s essential you know what conditions are attached, what they cover and how they can be complied with. Rather than refusing a planning application, a local planning authority (LPA) may grant permission subject to conditions, most approvals have conditions relating to the time frame to start a development and materials to be used, but often they have more and can vary between LPAs. This article from Northern Insight Magazine details the top 5 things to know about planning conditions. 1. necessary; without the condition should the application be refused? 2. relevant to planning; does the condition relate to planning objectives and is it within the scope of the permission to which it is attached? 3. to the development to be permitted; Does the condition fairly and reasonably relates to the development to be permitted? 4. enforceable; would it be practicably possible to enforce the condition? 5. precise; is the condition clear to the applicant and others on what is required? 6. reasonable in all other respect; is the condition reasonable? If you don’t think that a condition imposed meets the 6 tests you can apply to the LPA to modify/remove the condition, the application fee for this process is £234. If an application is refused you do have the right to appeal the decision, regardless of the outcome of the appeal the original permission remains valid and it is only the condition which is removed or modified. There is a mechanism to appeal the imposition of a condition on the initial application without going through the process to remove or modify the condition; however, if you appeal at that stage there is a risk as the whole application is reconsidered and could be refused in entirety. Pre-commencement conditions are those imposed on the grant of planning permission which prevents a start on site until the conditions have been adhered to, this could be by submitting information for agreement or ensuring a specific action is taken. In its emphasis to boost growth and avoid delays the government have imposed that from October 2018 all pre-commencement conditions must be agreed with the applicant prior to approval, this includes during an appeal process. This does not apply to prior approvals as that is not a planning permission. However, be aware if you don’t agree to pre-commencement conditions your application is likely to be refused. Conditions which require details to be submitted for approval (or in planning jargon discharged) can take up to 8 weeks from submission to the LPA, this additional time should be planned into your build schedule. The process to discharge conditions does require a fee to be paid to the LPA which is £34 for conditions relating to householder development i.e. extensions or £116 for other proposals. The charge is imposed for each submission; however, you can discharge more than one condition under the same submission. If you carry out a development without compliance with a condition, enforcement action could be progressed by the LPA. A Breach of Condition Notice (BCN) could be served which would require compliance to the condition, there is no right of appeal against these notices and you could end up at a Magistrates Court. If you have been in breach of a condition for in excess of 10 years there maybe potential for you to be immune from enforcement action. Conditions are imposed to avoid refusing an application, therefore don’t ignore them, if in doubt seek assistance from a Town Planning Consultant.